Washington Governor and presidential candidate Jay Inslee said Wednesday that climate change can't be solved unless the Senate filibuster and the Electoral College are both eliminated. 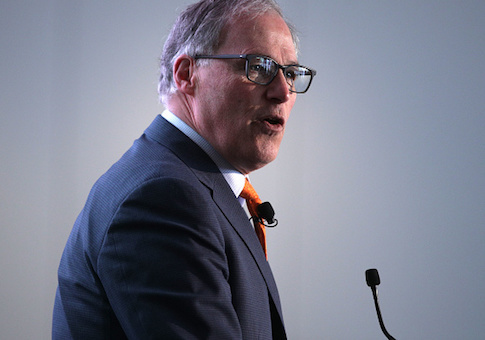 "I don't believe you can be serious about saying you can defeat climate change unless you realize we need to have the filibuster go the way of history because Mitch McConnell has weaponized the filibuster," Inslee said to a gaggle of reporters after a policy forum in D.C. "You can't be serious about having major decarbonization legislation in any near-term without removing the filibuster." Inslee's entire campaign is focused on the issue of climate change. He also joined the growing group of Democrats calling for the elimination of the Electoral College, something that has especially irritated the left after the 2016 election. "These are archaic relics of a bygone age," he said, according to the Washington Examiner. "We need progress. We also need democracy, which is one person, one vote. I've never understood why people who want to block progress like Mitch McConnell get one and half votes and people who want go defeat climate change only get one. That is a recipe for disaster when it comes to climate change." Four elections in U.S. history have seen a candidate elevated to the White House who did not win the plurality of all votes nationwide, including President Trump's election in 2016.